Interior Features Main Floor - has 3 Bedrooms, 2.5 baths, Hardwood floors, granite counter tops, Vaulted Ceiling, Trey Ceiling, Carpet in the Bedrooms, Laundry Room, Breakfast Room, Family room with fireplace and built ins, Formal Dining Room, Breakfast Bar, & Pantry. The Basement - has an entertainment room, built ins book cases, fireplace with gas logs, bedroom, full bath, space for a pool table and storage space in two areas. Exterior Features There is an attached 2 car garage, and a detached 2 car garage plus a large parking pad. The dock has a slip for the boat, a swim platform, double jet ski docks, and is covered. The front of the home is brick the sides and back are vinyl. There are two screened porches plus a patio on the backside. 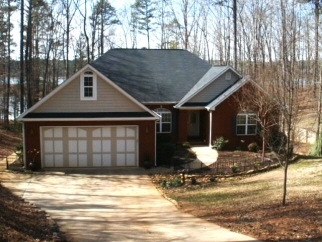 It is a easy walk to the lake and this home has a great lake view.